The Reserve Bank of India (RBI) faced an interesting question on Wednesday at the August monetary policy press conference. The RBI was asked if there was any engagement from the central bank over the controversy surrounding one of the three ‘too big to fail’ banks and if there was a bigger issue of governance at private sector banks. The question was ostensibly asked against the backdrop of allegations of conflict of interest made against CEO and MD of ICICI Bank Chanda Kochhar, and subsequent involvement of SEBI and the US SEC into the allegations. Dubbing discussion on a specific bank “inappropriate”, deputy governor NS Vishwanathan said that the RBI is aware of developments in the banking system and is “dealing with situations as they emerge”. “As far as too big to fail is concerned, there is a global standard for that,” he said, adding that additional capital required in the banks (to keep them healthy) is being maintained. 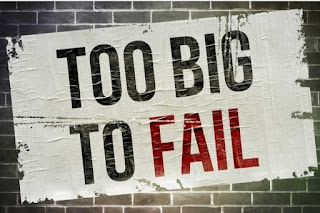 Popularised by US Congressman Stewart McKinney in 1884, ‘too big to fail’ is a concept used for banks or financial institutions that are so big and interconnected that if they fail, the economy is at the risk of substantial damage. The term gained more popularity during the 2007-08 financial crash. Indian banks are currently dealing with a huge pile of non-performing assets (NPAs), making provisions against which have led them to take losses in the last couple of quarters. Moreover, ICICI Bank and Punjab National Bank have been marred by controversies as well. “With the PSBs still under losses, net profits of all banks declined by about 30% in Q1 FY19 vis-à-vis a growth of about 18% witnessed a year ago,” a Care Ratings analysis of 15 public sector banks and 6 private banks said recently. While the overall NPA ratio increased to 7.92% of total loans in Q1 FY19 from 7.52% in Q1 FY18, PSBs have thrice the exposure than private banks. To deal with the banking crisis, not only did the Narendra Modi government introduced Insolvency and Bankruptcy Code (IBC) to clean-up NPA mess but also announced a massive Rs 2.11 lakh crore bank recapitalisation plan for PSBs, which is being infused in tranches. Back-to-back controversies of bank fraud and conflict of interest in PNB and ICICI Bank respectively created resentment among people, and questions were asked on the role played by the government, the RBI and other regulators in stopping such events from emerging.